With the publication of his new book The Curse of Cash, economist Ken Rogoff has ignited a big debate over the future of paper money. Both the book, which is packed with information and accessible to a mainstream audience, and Rogoff's series of blog posts are well worth reading, even if you already disagree with his premise that the way the world currently handles cash needs to be modified. The key observation motivating Rogoff's book is this one: with $1.3 trillion worth of U.S. currency in existence, a back-of-the-envelope calculation says that the average four person family should be holding around $16,800 in cash. However, this simply doesn't reflect the personal experience of most Americans. Indeed, 2012 survey data shows that consumers generally report holding just $56 per person, leaving the majority of cash unaccounted for. Nor is this anomaly confined to the U.S. Given $78 billion in Canadian currency outstanding, a four person family in Canada should hold around $6,000. Instead, survey data shows the average person only holds a median $38 in their wallets. The same pattern occurs in Europe, Japan, Australia, and elsewhere. According to Rogoff, much of the unaccounted cash is being held by those who participate in the underground economy, both by those engaged in criminal activity and those employed in legal activity (dentists, contractors, retailers, etc) who use cash as a way to avoid taxes. Rogoff's premise is that if we can alter the institution of cash, then maybe we can flush some of these people out of the underground economy and back into the legal, tax-paying economy. Having read through many of the criticisms that Rogoff has received over the last few months, I've noticed that there is a tendency on the part of his opponents to frame this debate as an either/or one. Either keep cash and the personal liberty it provides—anonymity and uncensored access to the payments system—or sacrifice cash and in the process throw out that liberty. This mischaracterizes the debate. Rogoff isn't advocating an end to cash or the liberties that go with it. Rather, he wants a modification of the existing denomination structure of banknotes such that the $100, $50, and $20 are removed while the $1, $2, $5 and $10 are left in circulation. Over the long-term, he proposes replacing these small bills with heavy coins. The set of personal liberties afforded by cash will be allowed to live on, albeit through the reduced convenience of small banknotes like the $10. The term denomination structure refers to the top and bottom-most denominations issued by the monetary authority, the spacing between denominations, and the point at which the transition between coins to notes begins. As per Tyler Cowen's second law ("There is a literature on everything"), academics have been writing on the topic of optimal denomination structure for a few decades. The goal of this literature is to find the range and spacing of notes/coins that reduces the amount of monetary work that all participants in a currency system must engage in. By monetary work, I mean the effort that goes into printing money, carrying it, storing it, counting it, making calculations with it, paying with it, and breaking it into smaller amounts. If a denomination structure can be found that allows everyone do a little bit less work, society is much better off. Rogoff takes the opposite approach. His abolition of large denomination banknotes is designed to increase rather than reduce the amount of monetary work that users of cash must engage in. After all, ten thousand dollars worth of Rogoff's preferred highest value note—the $10 bill—requires far more effort to count, store, and lug around than a hundred $100 bills. 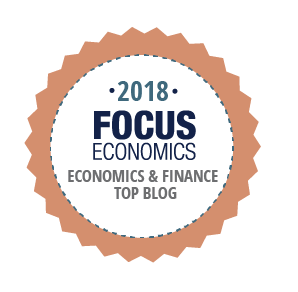 Rogoff believes that the increase in monetary work brought about by a reduction in the purchasing power of the highest value note can be a useful filtering mechanism for improving societal welfare. Assume that there are "bad" and "good" users of cash, the former being criminals and tax evaders and the latter being regular people who want to enjoy the speed, anonymity, and convenience of paper money. "Good" cash users only need small quantities of notes from time to time and therefore will only be slightly inconvenienced by the increase in monetary work caused by a constriction in the purchasing power of the highest denomination note. "Bad" users tend to make regular use of large amounts of cash, and will therefore be severely affected by a constriction. While Rogoff's abolition won't stop crime or tax evasion, it will surely make these activities trickier. This should in turn push activity out of the non-taxed underground economy into the legal economy. These ideas aren't entirely novel. In fact, I'd argue that since the 1800s, the U.S. has been implicitly adopting Rogoff's strategy of increasing the amount of monetary work involved in using cash. The chart below illustrates both the nominal and real value (in 2015 dollars) of the U.S.'s highest denomination banknote going back to 1871. In general, the purchasing power of the highest denomination note has been gradually declining. This has been mostly due to the fact that even as inflation erodes the dollar's value, American monetary authorities have chosen to avoid introducing new higher value notes. Nor is the U.S. unique in this respect. Correct me if I'm wrong, but I can't think of a single developed nation that has introduced a higher denomination note over the last fifty years. In the U.S.'s case, the decline in the purchasing power of the highest denomination note hasn't been entirely due to the combination of inflation and a lack of new large value U.S. notes. Take a look at what happened in 1969. Throughout the 19th century the U.S. Treasury was an issuer of $10,000 certificates, a practice the Federal Reserve would continue after its founding in 1913. However, on July 14, 1969 the Fed announced that it would put an end to this tradition by destroying all $10,000, $5000, $1000, and $500 denominations, leaving the $100 as the U.S.'s largest denomination. It did so on the very same day that Richard Nixon launched his famous war on drugs. Although the Fed claimed that its decision was motivated by the declining usage of large value banknotes over the previous two decades (PDF pg 624), the timing indicates that Nixon's crime push must have been a big reason. So largely through a policy of benign neglect (i.e. by passively allowing inflation to eat away at its purchasing power), the U.S. along with most developed nations have been gradually increasing the workload involved in using the highest value note. Assuming inflation of 2%, by 2095 or so the US$100 will buy as much as the $20 does today. By 2130, it will buy as much as the $10 does today. Rogoff isn't content with the gradual approach to increasing monetary work. He wants to add a one-time increase in the level of monetary work involved in using cash. This would involve a quick Nixon-style "tightening" of the filter, removing in one fell swoop all denominations above the $10 bill. Put differently, rather than waiting till 2130 for the $100 bill to be worth $10, he wants this event to happen now. Once a Rogoff-style high denomination notes abolition has been carried out, inflation will once again determine the rate of increase in the monetary work involved in cash usage. So ultimately, the great cash debate isn't about cash vs. cashlessness. For decades developed nations have been gradually increasing the burden of using banknotes. Should we stick with the status quo or speed things up a little? Rogoff makes one mistake in his book. As many people may know, Sweden is the only nation in which cash usage is in decline, a precedent Rogoff wants other nations to emulate. Several times in his book, Rogoff mentions that the Swedes have removed their highest denomination note, the 1,000 kronor, and that this removal helps to explain the nation's dramatic drop in cash usage. But this isn't the case. All that the Riksbank did was replace the old 1,000 kroner note in 2013 (which had Gustav Vasa on it) with a new Dag Hammarskjöld version. The 1,000 is still alive and kicking. This puts Rogoff in a somewhat uncomfortable position. Some other policy than the one he prefers is at work in the very country he puts forth as an example for all to follow. I think I might know what this policy is. As discussed in this excellent post by Martin Enlund, the Swedes implemented a tax deduction in 2007 for the purchase of household-related services such as the hiring of gardeners, nannies, cooks, and cleaners. This initial deduction, called RUT-avdrag, was extended in 2008 to include labour costs for repairing and expanding homes and apartments, this second deduction called ROT-avdrag. Prior to the enactment of the RUT and ROT deductions, a large share of Swedish home-related purchases would have been conducted in cash in order to avoid taxes, but with households anxious to claim their tax credits, many of these transactions would have been pulled into the open. 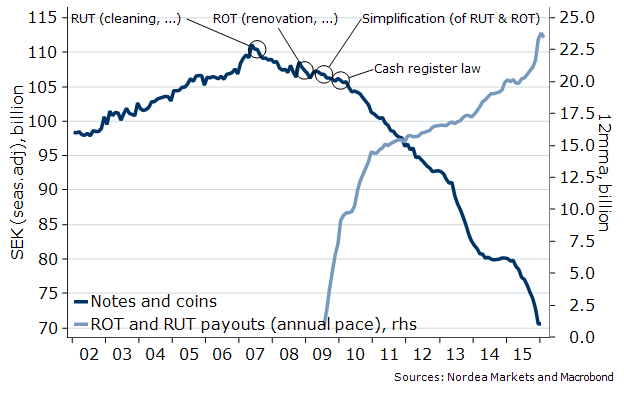 Note the rise in RUT and ROT payments on Enlund's chart, for instance. Calleman reports that the number of customers using registered domestic service companies rose from 92,000 in 2008 to 537,600 in 2013. Since the implementation of RUT and ROT, Swedish opinions on paying for undeclared work have changed dramatically. In 2006, 17% said it was completely wrong to to hire undeclared labour. In 2012, 47% felt it was completely wrong. Using data from a survey of the general public conducted by the Swedish tax authority, the charts below show how much knowledge Swedes have about those around them engaged in tax evasion. In the bottom chart, the number of Swedes who are aware of businesses that are evading taxes has fallen from 27% in 2007 to just 9% in 2013. That is an especially large and fast decline. As the tax authority points out, RUT and ROT is the likely explanation. Rogoff himself maintains in The Curse of Cash that the largest holdings of cash in the underground economy are due not to criminals but those engaged in legal work (like contractors) who are avoiding taxes. By cutting down dramatically on tax evasion among those engaged in household services and repairs, the RUT and ROT deductions may explain a significant chunk of the decline in Swedish currency in circulation. This post has gone long enough, so let me get to my final point. I agree with Rogoff's general point that it makes sense to burden cash users with ever more work since this burden disproportionately falls on heavy users like criminals. But Rogoff hasn't yet convinced me that the status quo policy of gradually increasing the workload involved in cash usage (via inflation) needs to be sped up by a sudden removal of every bill above the $10. After all, the Swedes are setting an example of how a policy of gradualism can be twinned with tax policy in order to get some of the very effects that Rogoff advocates, namely pulling people out of the underground economy into the legal economy. Is the Swede's approach better than Rogoff's high denomination note abolition? I'm not sure, I don't know enough about the economics of tax policy to arrive at a firm conclusion. But it seems to me that a more complete analysis of the real reasons for Sweden's cash miracle needs to be conducted before we go about killing the $20, $50, and $100. Nice critique. Rogoff needs better fact checking. Seems I remember a debunking of a similar nature of data used in This Time It's Different.